Now you can propose a time change for a showing without cancelling the original appointment. Based on which listing representative is confirming or cancelling appointment requests, either you and/or your seller will be prompted to accept or decline the original request. After that, they can propose a new time that works better. The showing agent gets notified immediately so they can respond accordingly. In the meantime, the existing appointment remains intact until the new time is confirmed by the showing agent and listing representative. Under the 'Appointment Availability section', type a message to the agent to let them know what time(s) works better. Below this, you will need to specify whether you would like to keep the original appointment or decline the original appointment if the agent is unable to reschedule based on the notes you provide. The appointment will now read as 'Confirmed-New Time Proposed' to reflect the action you just took while you wait for the agent's response. Under the 'Showing Availability section', type a message to the agent to let them know what time(s) works better. 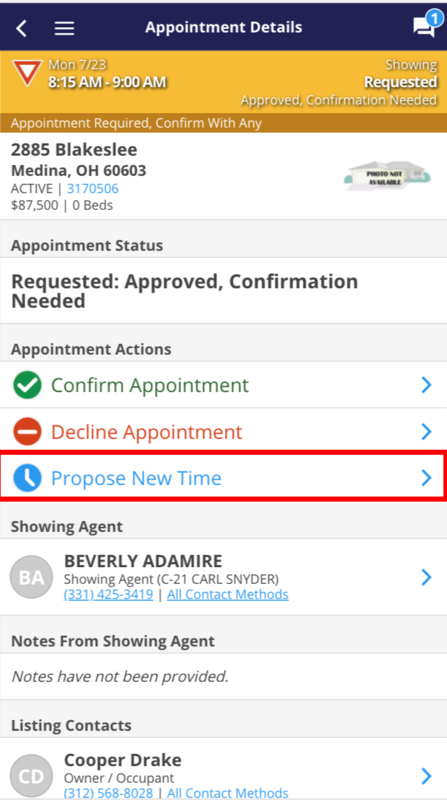 If the showing agent chooses to keep the original time, the appointment status will be 'Confirmed' and the showing instructions will be sent accordingly. 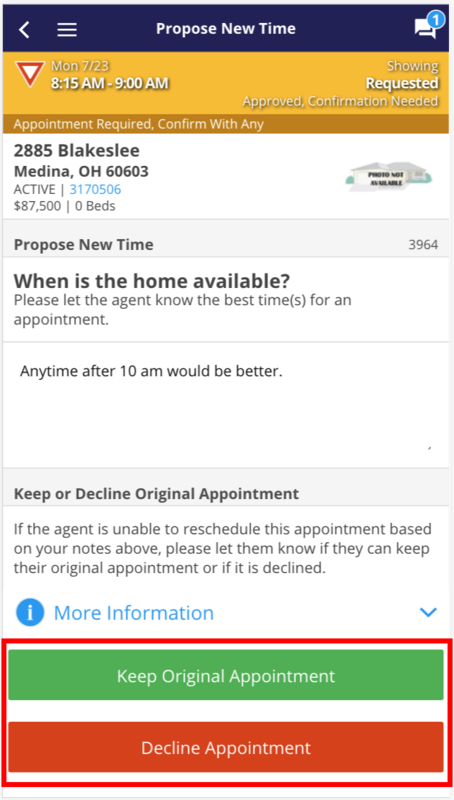 If the showing agent chooses to reschedule based on the availability notes you provided, they will be prompted to go through the scheduling process again for you or the seller to confirm or decline again.